Ready to take your wedding business onwards and upwards? Here’s how I can help. The Wedding Business Success Hub is a private Facebook group for wedding business owners to learn, support and share. Come and join us – it’s Free! My online courses are straightforward, come in manageable modules and are written specially for wedding business owners. Marketing Mastery helps you take control of your marketing so you spend more time doing the things you really love. 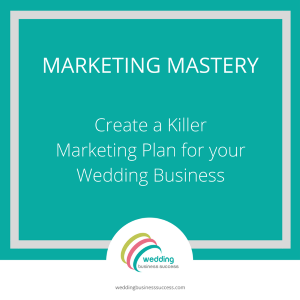 It takes you through all the steps you need to create an effective marketing plan for your wedding business. 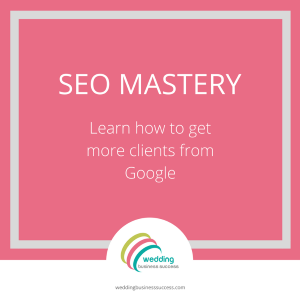 SEO Mastery brings you all the tools and techniques you need to get your wedding business found by your target customers. I’ve brought together my 13 years experience of getting businesses found on Google AND my in depth knowledge of the wedding industry. Owning your own business can be lonely – so wouldn’t it be great to have someone to guide you, offer you support and help you make the tough decisions? That’s where my mentoring options come in. While managing your own marketing is important, there are some things that are best left to the experts. After all, you didn’t start your creative business to get involved in technical stuff like websites and SEO. Can I tell you a secret? – I LOVE the techy stuff. So I’ve put together a range of affordable packages to help you.